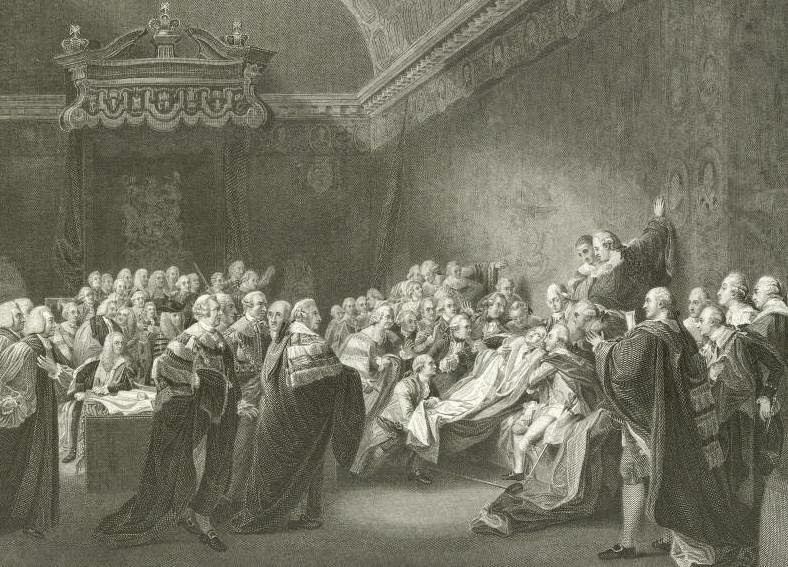 It is a pleasure to welcome Jacqui Reiter to the salon today with her tale of the Collapse of the Earl of Chatham. I am also taking part in the My Writing Process blog hop, so do gad over and have a read if that tickles your fancy! On the morning of Tuesday 7th April 1778, William Pitt, Earl of Chatham arrived at the Palace of Westminster from his country estate of Hayes Place. He was nearly seventy years old and had been suffering for some time from gout in the hands, but ill health could not keep him away from the House of Lords. In his opinion, the future prosperity of the country was at stake. The issue that called Chatham from his sickbed was a weighty one. General Burgoyne's disastrous surrender to the rebellious Americans at Saratoga on 17 October 1777 had opened a European free-for-all on a beleaguered Britain. France signed a treaty of alliance with America in February 1778 and Spain, too, looked likely to join the fray. Britain was fighting a war on two fronts. With the American war going badly, the opposition to Lord North's government called for peace. Chatham was one of the war's foremost critics, horrified at the prospect of alienating the Colonies he had secured for Britain during the Seven Years War. At the same time he was staunchly against admitting America's independence, for he believed America was 'the great source of all our wealth and power'. 'I will as soon subscribe to Transubstantiation as to Sovereignty (by right) in the Colonies,' Chatham fulminated to Lord Shelburne. Bad physical and mental health (including a minor stroke) had kept him out of politics for years, but Chatham had recently attempted a political comeback. 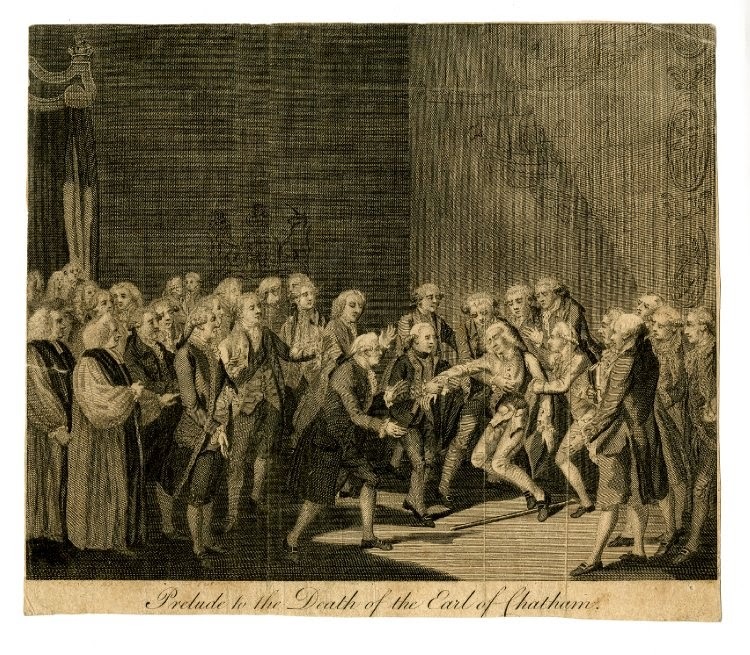 As late as February 1778 there had been rumours the King was about to call on him to form a new government (the King had different views: 'honestly I would rather lose the Crown I now wear' than submit to Chatham and his ilk). Chatham was old but still had influence, which was why the Duke of Richmond wrote to apprise him of the opposition's intention to move an Address calling for the Crown to acknowledge American independence and sue for peace. Richmond must have hoped Chatham would support the Address, or at least remain neutral, but Chatham immediately made his way to Parliament to oppose it. Ill health, however, had taken its toll. Lord Camden, Chatham's old political associate, later reported to the Duke of Grafton: 'Such was the feeble state of his body, and, indeed, the distempered agitation of his mind, that I did forbode that his strength would certainly fail him … in truth, he was not on a condition to go abroad, and he was earnestly requested not to make the attempt; but your Grace knows how obstinate he is when he is resolved'. Chatham came into the Lords supported on the arms of his second son, William Pitt, and his son-in-law Charles, Lord Mahon. Onlookers remembered him 'lapped up in flannel, pale and emaciated … he looked like a dying man'. Richmond outlined his motion and Lord Weymouth replied for North's government. At last Chatham rose. He 'was not like himself,' Camden wrote. 'His speech faltered, his sentences [were] broken, and his mind [was] not master of itself. He made shift, with difficulty, to declare his opinion, but was not able to enforce it by argument. His words were shreds of unconnected eloquence, and flashes of the same fire which he, Prometheus-like, had stolen from heaven, and were then returning to the place from whence they were taken'. Richmond replied briefly, reiterating 'there is not a person present who more sincerely wishes that America should remain dependent on this country … but … I am convinced that it is now totally impracticable'. He argued it was far better 'to retain them as allies' than 'throw [them] … into the arms of France'. When Richmond finished Chatham struggled to his feet again. None present would forget what happened next. 'He fell back upon his seat,' Camden recalled to Grafton, ' and was to all appearance in the agonies of death. This threw the whole House into confusion; every person was upon his legs in a moment', To his daughter Elizabeth, Camden was more graphic: 'You may conceive better than I can describe the Hurry & Confusion[,] the Expressions of Grieff & astonishment that broke out & actuated the whole Assembly. Every man seemed affected more or less except ye E[arl] of M[ansfield, an old political adversary of Chatham's] who kept his seat & remained as much unmoved as the Poor Man himself who was stretch's Senseless across a Bench'. Chatham was carried to the Prince's Chamber, where he was propped up with cushions and attended by Richard Brocklesby, a physician who luckily happened to be close by. Chatham's two younger sons William and James were present, and possibly also his eldest son John. One can only imagine what they must have felt on seeing their father fall. While Chatham slowly recovered his senses, Richmond adjourned the debate until the following day as a gesture of respect. 'I hope for the best,' Camden concluded his letter to his daughter, 'but according to my desponding temper, I fear the worst.' Camden was right to do so. Although Chatham recovered enough to be moved to Hayes the next day, he had suffered what was probably a severe stroke. He lingered for just over a month and died on 11 May. Parliament voted to pay his debts and give him a public funeral in Westminster Abbey. 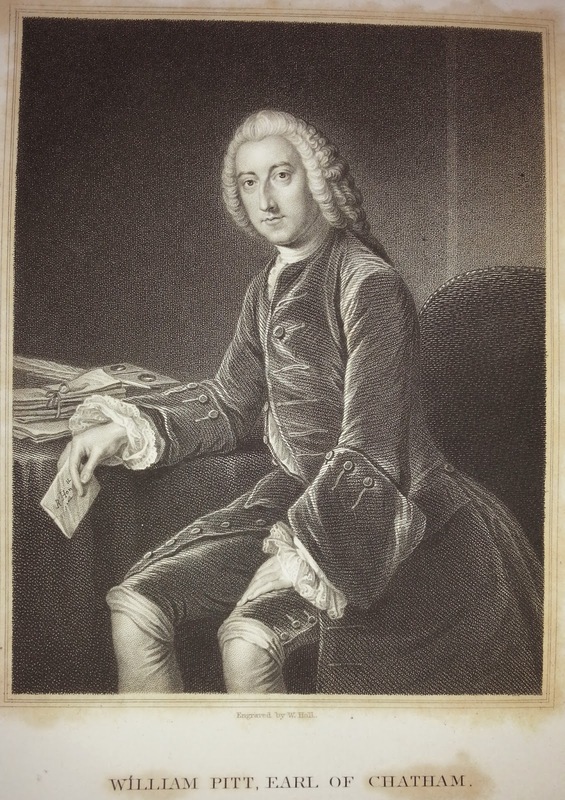 It was a fitting end for a man whose political style could best be described as theatrical: in the (somewhat cynical) words of Chatham's political heir Lord Shelburne, 'always made up, and never natural'. Certainly it was a memorable exit, and the American portrait artist John Singleton Copley decided to commemorate the occasion for posterity in a magisterial painting. This painting is currently on display in the National Portrait Gallery, London, and makes as much an impression on the viewer now as it must have done two hundred years ago. Written content of this post copyright © Jacqui Reiter, 2014. I absolutely agree; I am in awe of what he achieved on that day. There was definitely a strong streak of bloody-mindedness in that family. I cannot wait to read anything and everything Jacquie Reiter produces. Just wonderful.